Yes, it has the wheels back on, and may have its head back on by next month. The practice sessions on Saturday were merely damp, providing an opportunity to scrub in the new tyres and check that the engine was happy with its new Jawa valve springs – all was well except for some clutch slip, which was sorted on Saturday evening. Although the weather caused the Sunday morning practice sessions to be cancelled, the Cavalcade provided an opportunity to check that the clutch was working properly. All very promising. I had expected my previous nemesis Robbie to be there with his Bantam, but instead there was a 1978 Yamaha 125 TZR – the only way I was going to beat that was if the rider was afraid of the wet on such a beast, which he wasn't, putting in one of the best times of the day, a tad faster than Scott Redding on a 1000 Honda. That left three 175/185 Hondas and three rather fast racing 50s to cope with, it was clear on the warm-up lap that they were not going to give me an easy time. Instead of blasting cleanly off the line as it had in practice, the Cub stuttered and bogged down initially, but more or less cleared at high revs. This may have been simply due to the increasing rain getting into bits, the puddles were making life interesting and it was impossible to see the edge of the track through the wiggly bits. In the end the Cub managed to hold on to 2nd place, so not a bad result. Unfortunately there is perceptible play in the big end so a strip-down is needed, I can't see me making it to Anglesey next month but I am looking forward to Brands Hatch in July. If engine, gearbox and clutch can all be persuaded to behave themselves, it should be good fun. 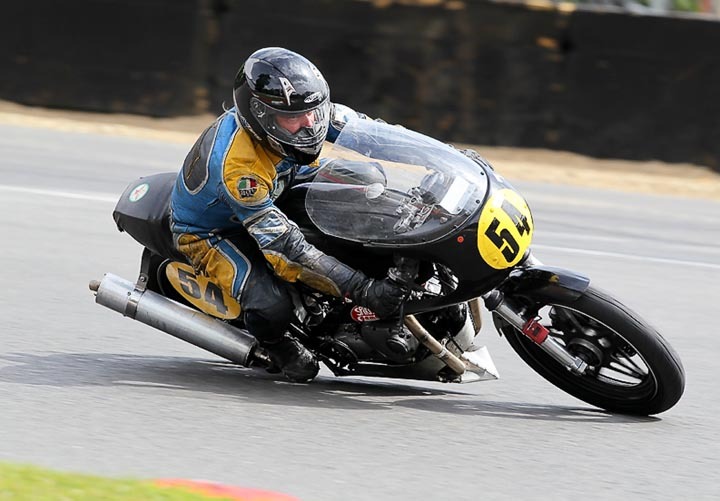 Brands Hatch High hopes of a good outing on the Cub at Brands were shattered by the head gasket blowing on the first lap of practice, and a slight gearbox problem at Darley Moor had turned into a big one. Practice was fun on the Daytona, but it still had the road tyres on from running in new pistons, so squirmed a bit. I had last year's race tyres with me, so changed to those for the first race – they were horrendous, or the front one was at least, slip-sliding away and quite likely to lapse into other Paul Simon songs. Failing to catch Jenny – and she had never raced at Brands before! After discussion with the tyre man and getting permission from Sally, a large sum of money was invested in a brand new front tyre. 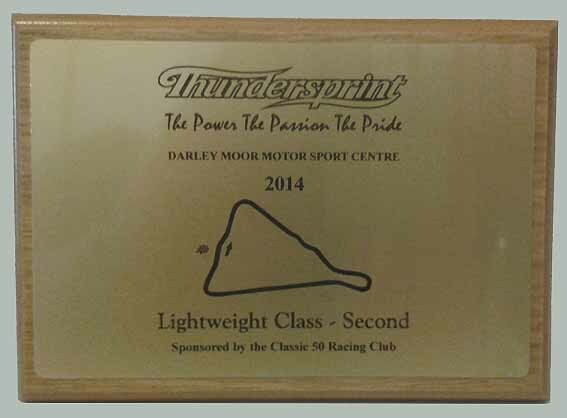 In the second race I got round as fast as I have in recent years, still only good enough for 8th out of 13 in our class but if another second could be shaved off the lap time it would start to look respectable. The races were later on Sunday, which gave me the time to finish off a top-end rebuild of the Cub after giving the gearbox some attention. Alas, it still did not feel entirely well, and the head gasket blew again after 4 laps, though at least the gearbox was behaving. As I write this, the engine has been rebuilt with a lower compression piston and the timing has been carefully checked again. The Daytona continued to feel OK but was throwing out increasing amounts of oil onto my legs, though not enough to get onto the back wheel or the track – it was also smoking sometimes. And the lap times got a second slower instead of faster. Hmmm. Donington Park Traditionally, all manner of things go wrong for me at Donington, and this year was certainly no exception. 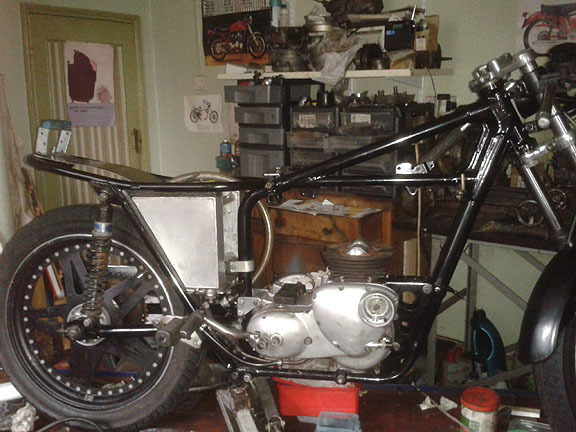 The Cub sported a new oil seal behind the clutch, which was expected to allow the correct amount of oil to be put in the chaincase. At home, it was fine. Warming the bike up in the paddock, still not a drop. Lining up for practice - dripping steadily, I had to miss practice and drain the oil out, the chain would just have to suffer. The Daytona went OK in practice, but I was all at sea, but two seconds off the lap time would put me dicing with my usual opponents. 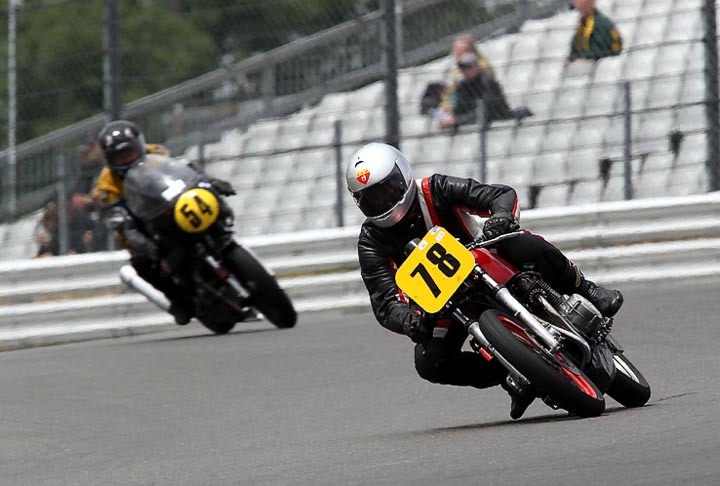 The first race was on the Cub, it was not going as well as it should, but at least I was getting the hang of the corners again, and I was really looking forward to the first race on the Daytona. Halfway round the warm up lap, it stopped. A connector had come off the battery - an ad hoc arrangement since its nearly-new normal battery had packed up - so I expected the bike to start as soon as I had reconnected it. But no. Back in the paddock, tests indicated that the electronic ignition had packed up. 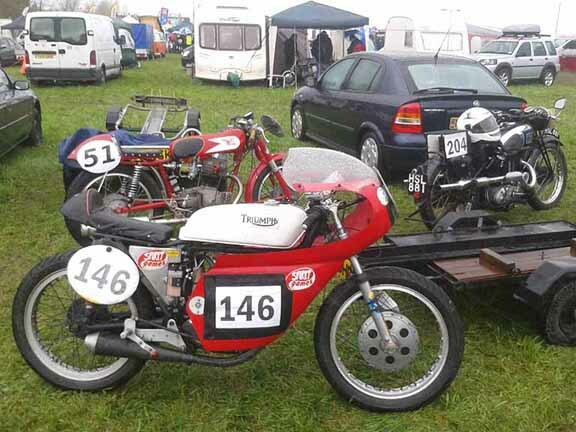 This was a three day meeting, with just the one race for each bike on the Friday, so I was able to take the Cub back home to investigate the lack of power, and strip bits off road bikes to make up a new ignition system for the Daytona, duly fitted on Saturday morning. 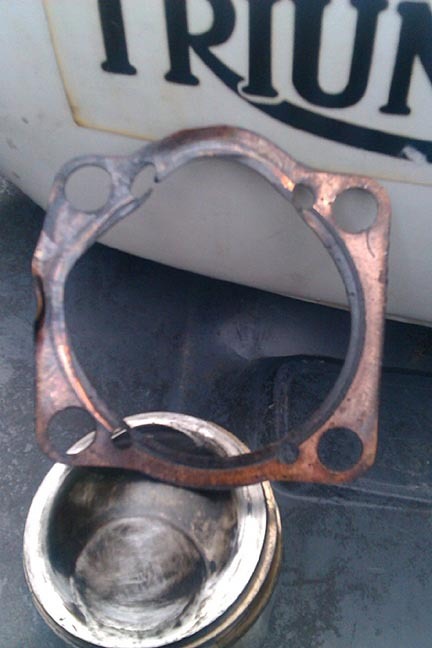 Still no spark, the problem eventually being traced to a broken wire behind the ignition pick-up. By the time that had been re-soldered, another race had been missed. The one race was quite fun, dicing with one of the bigger, faster bikes with a novice rider, but while I went the required two seconds faster than in practice, everyone else had had two more races to remember how to ride the circuit, so I was still two seconds off the required pace. The Cub just got slower and slower, but did at least finish, eventually.